This stylish desktop/wall-mount jumbo atomic clock and weather forecaster is ideal for your home or office. Easily seen from across the room, it automatically sets the time, day and date by receiving signals from the U.S Atomic Clock. 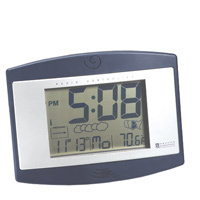 It displays indoor/outdoor temperature, pressure trend and local weather predictions with graphical icons. It features jumbo 2" digits, day/date calendar with daily alarm and 8 minute snooze. Actual size: 10.5" x 1.25" x 8.0"
© Copyright 1999 - 2002 Innovationhouse.com. All Rights Reserved.